Can you believe Christmas is one week from today?! Where did the year go? This fall passed in a flash while I was in London, so it feels surreal to already be heading round the corner to 2016. I head home to Austin a little early tomorrow, as we’re doing a cousin’s Christmas gathering on Sunday and celebrating my sister’s birthday on Monday. I’m looking forward to being in Austin for a little over a week (at least!). I still haven’t decided what to do for NYE, so I may end up staying in Austin even longer than that! Generally my outfits this time of year revolve around some of the same several basics you see on here often – like my favorite black skinny jeans and leather over-the-knee boots, for example. 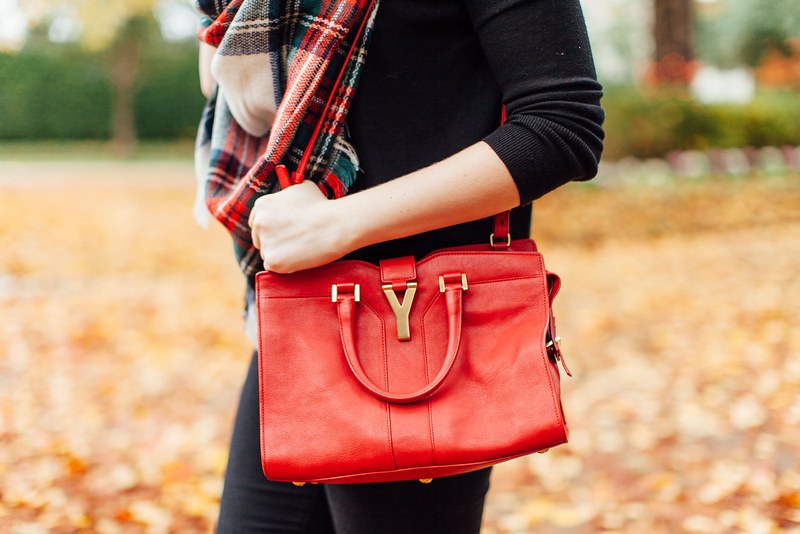 Recently I’ve been adding on some Christmas-y pops of color like this red bag I got a couple years ago (a classic! ), and this oversized plaid scarf (same scarf, different colorway here) I picked up last month. 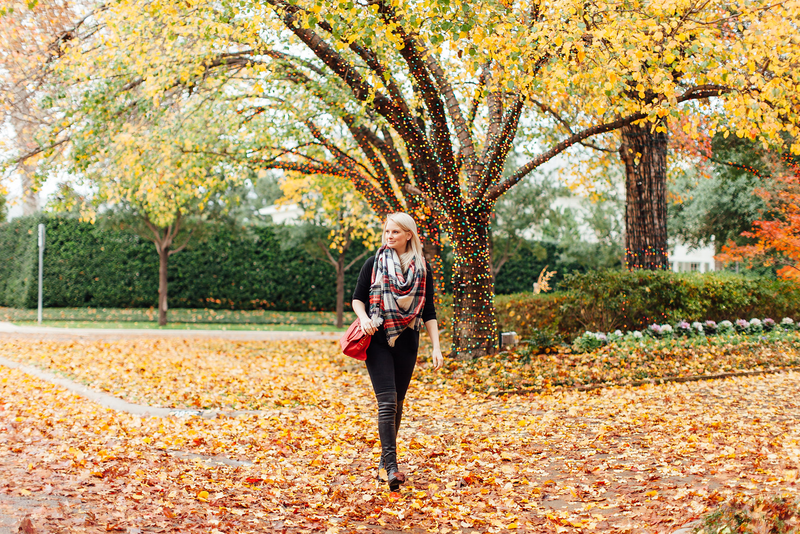 That add the right touch of holiday cheer without taking over the ensemble. This red Tory Burch tote is a great price point and a useful piece for any gal. 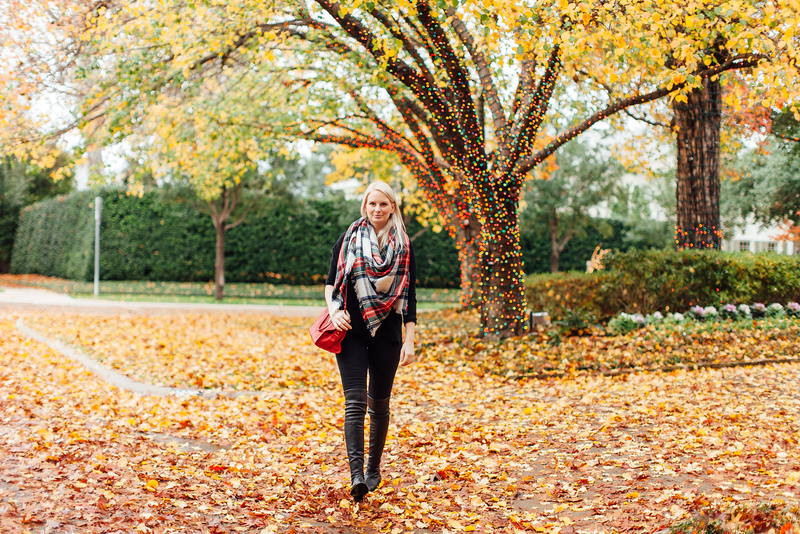 This cozy Christmas blanket scarf is only $20! Go big and gift yourself this sleek cherry red Saint Laurent clutch. It’s a piece you’ll have forever! This Stewart plaid shirt is an inexpensive and very wearable gift! Get some candy red flats to jazz up even the most basic ensemble this holiday season. If you just want a teeny tiny pop of color, these earrings are the ticket! Love those boots and major bag envy right now! I love a Christmas plaid! Your scarf is adorable! Loveeee those boots! Have a great time in Austin! Such a great look – and the backdrop on these photos is gorgeous!! love! What fabulously festive photos, Merritt!!! Great photos! I like your scarf! These pictures are stunning! Your location is absolutely spectacular, and your outfit is perfect for the holidays. I’m in love with the whole look. So cute! I love the scarf! What gorgeous photos! I love the plaid with your all black and red bag.